Thousands of spectators are expected to flock to Putney on Saturday to witness the start of the world famous university boat race between Oxford and Cambridge. Restaurants, pubs and bars in the town centre are expected to enjoy a roaring trade throughout Saturday from rowing fans. But the influx of so many visitors means that parking spaces on Putney embankment, where the biggest crowds gather, have to be suspended on Saturday. The Council informs us that suspensions will commence at 8am. Motorists who park their cars there overnight on Friday will need to move them by this deadline. Vehicles left in parking bays after this time are likely to be towed away. Normal parking rules will be reinstated at approximately 7pm on Saturday evening once spectators have departed. Signs notifying drivers of the changes have been placed along Putney Embankment. 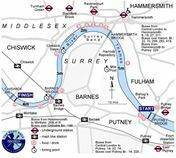 The annual showdown between Oxford and Cambridge, which dates back to 1829, runs between Putney and Mortlake. This year's race begins at 5pm but the reserve crews race better known as Isis v Goldie take place at 4.30pm.